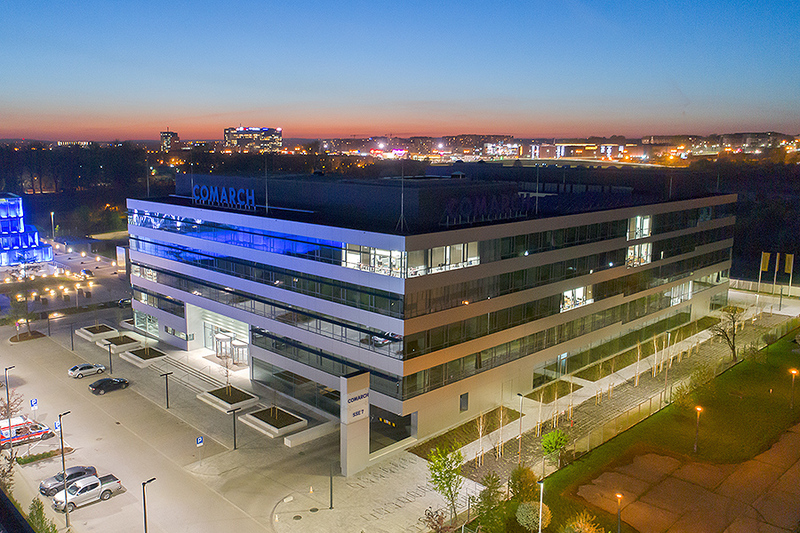 Another Comarch's building has been commissioned in the Special Economic Zone in Kraków. Colloquially referred to as the “seven”, the building has been constructed in the IT company's campus in Kraków's Czyżyny District. The office building has been equipped with photovoltaic panels, and the underground floors house charging stations for electric cars. The building has five floors above the ground, and its total area is over 27,000 sq. m. Moreover, employees and visitors have been provided with an underground car park for 157 cars and 86 stands for bikes. “In Kraków, Comarch currently employs some 3,000 staff. Until now, the employees used to occupy six buildings owned by Comarch, and in addition, we had to rent space in office buildings located in the economic zone. Now, all employees of the company's branch in Kraków work in Comarch's office buildings. Additionally, the new building has been adapted to receive trainees who will join the team during a summer holiday period” says Konrad Tarański, Vice President of the Management Board and Finance Director of Comarch. The office part of the SSE7 building has been designed as an A-class structure, or it offers the highest standard of finishing and technical equipment. The building has been designed to care for the natural environment and ecology. Photovoltaic panels have been fitted on the roof to partially supply for the company's need for electricity. “Photovoltaic panels installed on the building's roof are capable of generating maximum 64kW of electricity daily. Which means that by using an alternative source, we're capable of powering some 1,000 computers. Currently, some 1,200 persons work in the building, and maximally it may house 1,700 staff” says Łukasz Jastrząb, Director of the Strategy and Analysis Office at Comarch. The building has four usable floors and one technical floor on its roof. The ground floor houses mainly conference rooms, while upper floors offer office space. All rooms have been equipped with a separate smart ventilation and air-conditioning system which at the same time is a source of heating. At night air-condition operates in a green mode, and in the morning, it warms up premises in advance up to the temperature set in the control panel. The design has been prepared by Biuro Architektoniczne Artur Jasiński i Wspólnicy, and Budimex S.A. has been the General Contractor of the project.